During that era, it was very fashionable to have fintails on cars; and typically of Mercedes Benz, this was done very subtly and with typical Mercedes style (arguably unlike their American friends - which tended to have massive fins). Many people remain at extremes when it comes to rating their looks, they either think they're really ugly, or think they are very cool. I, of course, subscribe to the latter school of thought. The first car I ever owned was a 1961 220S; so finnies will always tug at a heart string for me. Their Mercedes code was W111 series and W112 for the long wheelbase (300SE).The first of the finnies included compact models such as the 190D (used as taxis commonly - D for diesel) and the more luxurious 'S' class models such as the 220Sb, 220SEb, 300SEb and the two door equivalents. The two door series did not have fins on the back; in my personal opinion, these series of two door cars were amongst the best looking cars ever built. They have some of the most beautiful lines in the business. Here's a pictureof my 1962 220SE coupé (please excuse Angie and I for being in your way). Aside from the beauty of the outside of these cars, the interiors were beautifully designed. The dashboard, instrument cluster, speaker cover and centre console between the seats were solid pieces of exotic woods. 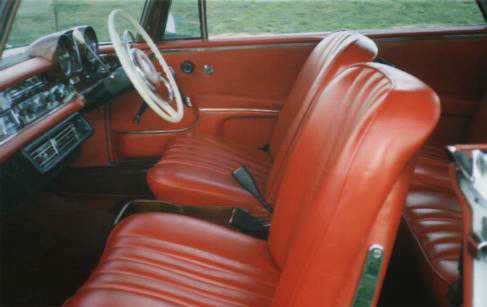 The seats were covered in leather, my favourite colour on these is red, as in the interior shown below. In most countries at the moment, finnies are a particularly good option if you wish to drive a grand (not to mention very reliable) piece of motoring history at a bargain price. It would be fair to expect to pay under US$8,000 almost anywhere for a good one. Prices for concours condition models may fetch up to US$30,000; but often with a concours car, it's a sellers' market, so any price is possible, not to mention cars in concours condition are generally not bought to drive. Finnie fanatics have visited this page times.